El Salvador's roads are less travelled compared to other Central American countries, making for a country which retains that elusive quality travellers often look for: adventure. From dramatic volcanic landscapes to blue-green lagoons, from the bustle of San Salvador to the quiet wilderness of El Impossible National Park, this guidebook will help you make the most of your visit to this spectacular country. 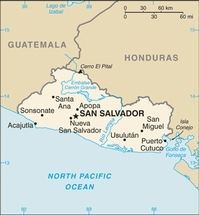 The content of Footprint Focus El Savador guide has been extracted from Footprint's Central America & Mexico Handbook. Essentials section with useful advice on getting there and around - Comprehensive listings of where to eat, sleep and party - Detailed street maps for San Salvador and other important towns and sights - Slim enough to fit in your pocket. Travel writer Jaime Jacques shows travelers the way to the best of El Salvador-whether it's surfing in El Tunco, sipping horchata in La Libertad, or seeing a show at the Teatro Nacional. Along with her in-depth coverage, Jacques includes unique trip ideas, such as Art: Past and Present and Survival of the Fittest. Complete with details on everything from the best museums to the best shopping centers, Moon El Salvador gives travelers the tools they need to create a more personal and memorable experience. Long a destination for serious surfers, El Salvador remains the "undiscovered" destination in Central America, inexpensive to visit and rich in local color. In this new El Salvador guide you'll find great information on the best places to stay, eat, and travel. And with a special surfing section and complete information on events, activities, and national parks, you'll never be wanting for something to do. Bestellingen Boeken en landkaarten bestellen is eenvoudig.